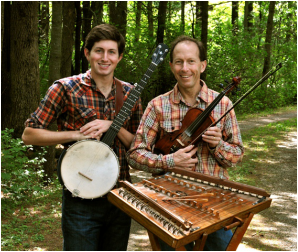 Baltimore’s nationally-acclaimed father-son Old-Time roots duo Ken & Brad Kolodner once again join forces in their 6th annual post-Thanksgiving concert with Charm City Junction. Joining Ken and Brad to round out the quartet is the incredibly versatile bassist Alex Lacquement (The Bumper Jacksons, The Ken & Brad Quartet, Charm City Junction) and the Old-Time superstar fiddler-vocalist Rachel Eddy (The Early Mays, Uncle Earl). This intimate post-Thanksgiving concert features a reimagining of Old-Time, Bluegrass and Irish music at the Stony Run Friends Meeting House. Charm City Junction is a fantastic acoustic roots music band that has rapidly garnered national attention with their inspired performances and debut album released on Patuxent Music in 2015. 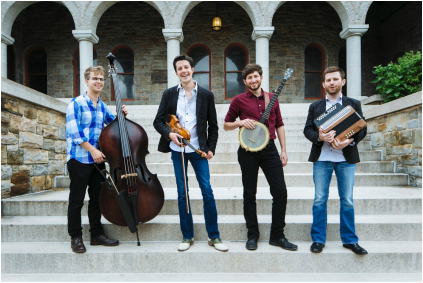 The group features Brad Kolodner on banjo, renowned Bluegrass fiddler Patrick McAvinue, button accordion master Sean McComiskey and Alex Lacquement on bass. The bands will unite for a big jam and not-to-be-missed collaboration! Make reservations online or call Ken at 410-746-8387 to do a credit card over the phone or for other ordering options! There is a $1.50 service fee for a credit card reservation order. NO TICKETS ARE USED FOR THIS SHOW. WE MAINTAIN A RESERVATION LIST. PROVIDE YOUR NAME AT THE DOOR!